FORT LAUDERDALE, Fla. (AP) — Lawsuits and judges’ orders have been piling up across Florida as the state struggles through vote recounts for several races, including U.S. Senate and governor. Six of the lawsuits that could have the most impact on the recount were filed in U.S. District Court in Tallahassee by Democrats. Others were filed by Republicans in a variety of counties. The major races involved are the Senate contest between Republican Gov. Rick Scott and Democratic incumbent Sen. Bill Nelson; the governor’s race between Republican Ron DeSantis and Democrat Andrew Gillum; and the battle for agriculture commissioner between Republican Matt Caldwell and Democratic Nikki Fried. The Florida Democratic Party sought to extend the deadline for people to correct ballots with signatures deemed not to match what’s on record. U.S. District Judge Mark Walker decided Thursday to give some voters until 5 p.m. Saturday to fix their ballots. The Scott campaign is appealing that ruling. This lawsuit also filed by the Democratic Party and the VoteVets Action Fund seeks to validate vote-by-mail ballots that were postmarked before Election Day but received after that. The lawsuit contends voters should not be disenfranchised because of postal service speed. The case is pending before Walker. 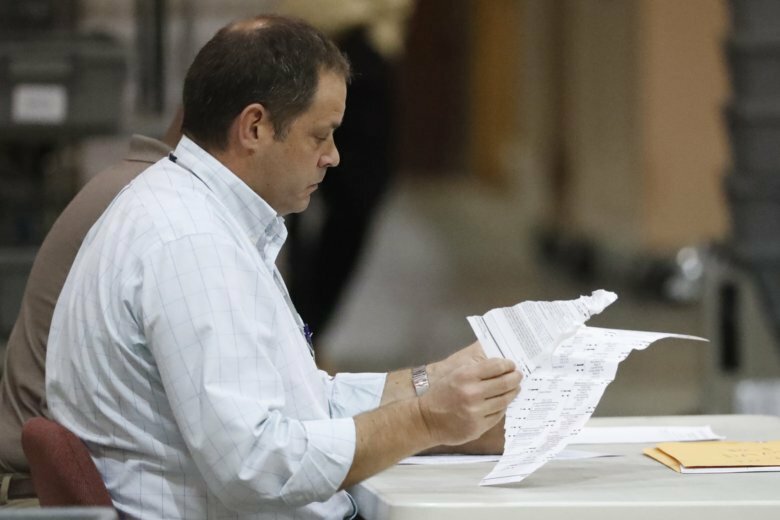 A third Democratic Party lawsuit asked that all counties be given enough time to finish both a machine and a manual recount. The Democrats contend more populated counties will have more difficulty meeting the deadlines and should be allowed time to count every vote. Walker refused Thursday to extend the deadlines. The Democrats also want to set a new standard for voter intent. Under state law, voters must use only approved markings or their ballot is disqualified, and they can’t simply cross out a mistaken vote but must explain in writing why they did so. The lawsuit contends that has a discriminatory impact on non-native English speakers and illiterate voters. Walker has this case before him, as well. The League of Women Voters of Florida and Common Cause seek to limit the role Scott can play as governor in administering the election and recount because he has a conflict of interest. Scott’s lawyers said at one hearing that he would recuse himself from sitting on the board that certifies final election results. But the lawsuit wants to bar the governor from having any influence over the canvassing process or authority to suspend election supervisors. Democrat James Bonfiglio, in a recount for a Palm Beach state House seat, wants to make sure Palm Beach County election officials have time to recount his race. A state judge agreed to extend the deadline for all of Palm Beach County, but the case was moved to federal court and remains pending. Nelson’s campaign filed a lawsuit asking a judge to order a full manual recount of all Palm Beach County votes because equipment failures and other problems resulted in that county’s failure to submit a machine recount to the state. The lawsuit asks the judge to order the manual recount to be completed by noon Sunday. Scott’s Senate campaign sued Broward County in an effort to prevent elections officials from counting ballots that were valid but that had not been canvassed by the Nov. 10 deadline for the initial unofficial total. A judge sided with the county Thursday. A judge sided with the Scott campaign in another Broward County lawsuit, this one involving Florida’s public records laws. Scott’s lawyers contended that Broward Supervisor of Elections Brenda Snipes was violating state law by not complying with their requests for access to a variety of election records. The judge agreed, and Snipes provided the information. This lawsuit by the Scott campaign contended that Palm Beach County Supervisor of Elections Susan Bucher improperly refused to allow Republican representatives to witness the processing and duplication of ballots that were physically damaged. A judge ordered that any such ballot that is disqualified should be reviewed by the county canvassing board and Bucher should provide a list of all voters who voted by provisional ballot. Scott’s campaign also filed lawsuits in Broward and Palm Beach counties seeking to have voting machines impounded by the county sheriff and the Florida Department of Law Enforcement when not in use. In Broward, a judge wouldn’t go that far but said extra deputies would be stationed at the elections office to keep watch. In Palm Beach, the lawsuit was defused when elections officials agreed to a similar arrangement.